If you take a look around the gym, you’ll notice that almost everyone is into performing major compound lifts these days. This is with good reason, since squats, presses, deadlifts, and rows are some of the best exercises you can do for overall muscular development. However, one thing you’ll notice is that everyone employs a bilateral strategy to their lifting. That is, they tend to perform a given lift with both legs/arms simultaneously. This is natural given the fact that we tend to mimic what we see in other people. Since most people perform bilateral compound movements in the gym and on social media, we simply follow suit. But, every now and then you see someone doing a one-legged deadlift or a single arm dumbbell press. This is appropriately named unilateral training since you are only using one limb at a time to perform a movement. At first, you might think this is counterproductive since they are obviously using much less weight compared to the bilateral version. More weight equals more gains, right? Although that is generally true, there are other things to consider with unilateral training. Despite the use of lower absolute weight, there are some serious benefits to both strength and hypertrophy that come from unilateral training. In fact, including some unilateral work in your training program will likely make you a much better athlete overall. If you’ve ever dipped your toe in the world of bodybuilding, you’ve most likely done at least a little bit of unilateral training. This probably came in the form of some sort of isolation exercise such as a concentration curl, lateral raise, or a behind-the-neck tricep extension. Overall, these are great exercises for maximally targeting each muscle individually. The logic behind isolation exercises for hypertrophy reasons is pretty sound. You are focusing on maximally contracting one muscle at a time, which allows you to fully tax that muscle on either side of your body. 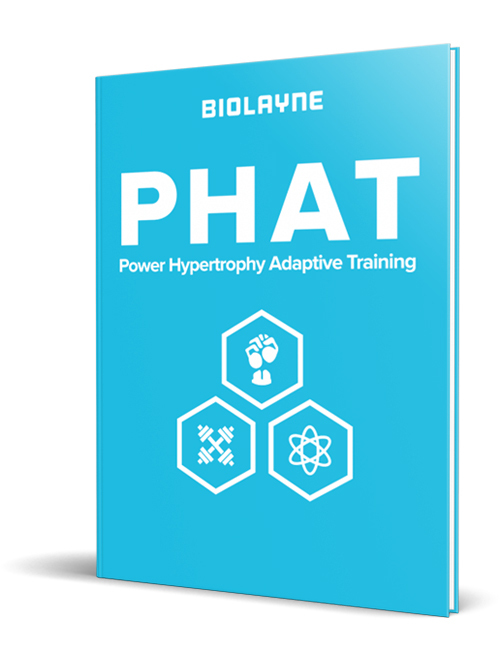 This has long been known as the “mind-muscle” connection, which is thought to improve muscle hypertrophy  . Indeed, a recent study found that focusing attention on muscle contraction during each exercise produced greater muscle hypertrophy over 8 weeks  . So, there is definitely merit to unilateral training as it pertains to increasing muscle mass, but for some reason, people seem to shy away from performing unilateral work for compound movements that target larger muscle groups. In actuality, performing unilateral work on these big muscle groups will lead to the same improvements in muscle hypertrophy that we see in the smaller muscle groups. Leaving these kinds of unilateral exercises out of a training program ultimately means losing out on potential muscle hypertrophy. You may notice that when you perform a bilateral exercise, one side performs slightly better than the other. Because of this, one side gets a better workout than the other, which can lead to some asymmetries in your physique. However, when you perform that same movement unilaterally, the discrepancy in eliminated. This leads to more total work being done by each side and can result in more hypertrophy over time. Not only that, but both sides will develop more evenly given the fact that the same effort is applied to each side. The result is a more muscular and symmetrical physique, which is something that I’m sure everyone would welcome with open (and big) arms. Are Bodybuilding and Powerlifting Mutually Exclusive?